What if Russia demands a naval base in Finland or invades a Swedish island? This is a translation of an article by Michael Moberg, James Mashiri and Charly Salonius-Pasternak in Suomen Kuvalehti issue 9/2015, published online on February 27, 2015. It was titled “Venäjä vaatii Suomelta laivastotukikohtaa, Gotlanti miehitetään – voisiko näin tapahtua?” Permission to post this translation (Charly and James helped with numerous corrections) was granted by Suomen Kuvalehti. The excellent graphics are by Hannu Kyyriäinen (SK). In a similar vein, Salonius-Pasternak wrote a piece in Helsingin Sanomat (“Suomi voisi olla sotilaallisen iskun ensimmäinen kohde” on December 29, 2014) considering the implications and likely Finnish reactions to Russia’s fictional invasion of a few Finnish islands, for example from the Åland archipelago. Three gloomy scenarios in the Baltic Sea. What would Finland do? Preparing for the worst is vital for every independent nation. Scenarios as possible chains of events are an important tool of assessment. The events described below are completely fictional. These aren’t predictions of the future. They are fabricated chains of events to facilitate thinking and planning. Our scenarios are located in the Baltic Sea. Central factors in them are the level of readiness of the countries around Finland and that of NATO as well as Russia’s military capabilities and it’s willingness to use military force. Russia’s modes of action are taken to include several elements of hybrid warfare as well as those of information and psychological warfare. In our scenarios the timelines are rather short and situations develop quickly. We fictionalize decisions by other countries and by NATO and their possible actions in the depicted events. We have chosen to leave Finland’s final actions open and have not stated the impact and conclusions the scenarios would have for Finland. Our goal is to challenge the reader to sketch out the situations further. The scenarios have been vetted with other experts and their comments have been taken into account. Michael Moberg is a retired Lieutenant (N) whose service includes Nyland brigade, Afghanistan and the headquarters of the Finnish Navy. He is currently in private business. Lieutenant (N) James Mashiri is a security policy blogger and serves in the Finnish Defence Forces Logistics Command. Charly Salonius-Pasternak is a Senior Research Fellow at the Finnish Institute of International Affairs (FIIA). Åland (Ahvenanmaa) facing Russian hybrid warfare. 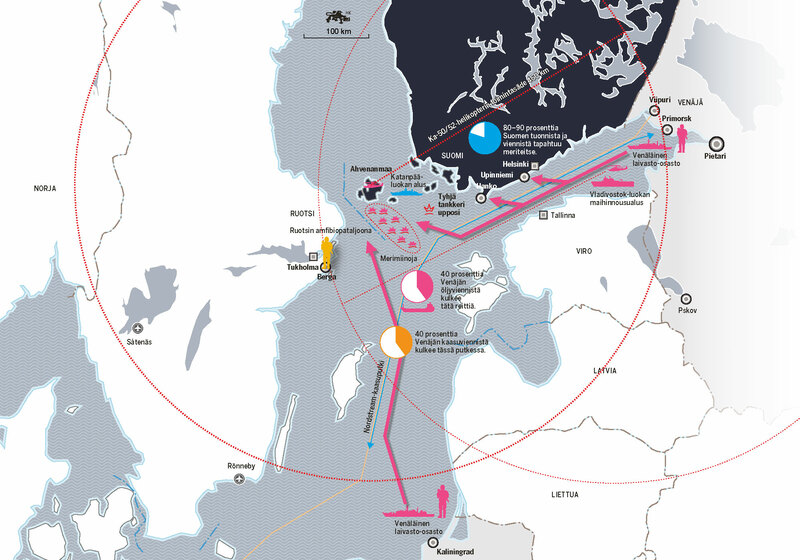 40% of Russian oil exports are carried via the Baltic Sea. The Nordstream gas line carries 40% of Russian gas exports. A month ago an oil tanker with a full cargo was captured in the Baltic Sea. Two weeks ago Russia announced that there had been an attempt at sabotage on the Nordstream undersea gas pipe 40 kilometers south of Helsinki. Only a faulty radio-controller unit prevented an explosion and catastrophe. Videos from a group called Oil Fighters Front (OFF) have been spreading in social media. 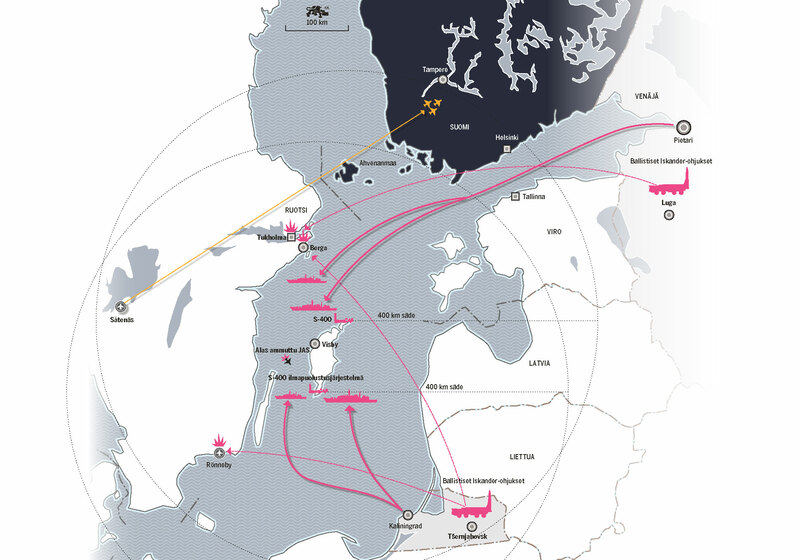 In those the reasons for OFF’s strikes against Russia’s oil export via the Baltic Sea is given. The leader of the organization who calls Åland, Finland, his home has publicly thanked a political party that is part of the Finnish government for their support. The Finnish prime minister denies any claims of support from the Finnish government. Soon there after news emerge that an attempt to capture another oil tanker has been made. Russia announces that it will step up patrolling in the Gulf of Finland and in the northern Baltic Sea. Despite the increased monitoring, an oil tanker that was returning to the Primorski oil port without cargo sends a distress signal late at night using international emergency frequencies: there has been a massive explosion below decks and the ship is sinking. The crew is rescued, but the tanker is lost about 30 km south of the island of Jurmo. The Russian Baltic Fleet and the Western Military District begin a wide-scale readiness exercise the very next morning. A full combat unit of marines with all gear from vehicles to anti-aircraft missiles is loaded onto ships. On Saturday morning the international media is told of a Russian fisherman who has seen sea mines in the northern Baltic Sea. The information is corroborated with photos taken by the fisherman. Cargo ships immediately begin to change their routes and by the afternoon all sea traffic in the region has ceased – and along with it 90% of Finnish imports and exports. Finland announces that it is sending a minesweeper vessel of the Katanpää class to the area. All focus is, however, taken by Russia’s announcement that it is now forced to shoulder the main responsibility over the security of the Baltic Sea, because terrorists supported by western governments are trying to destroy Russia by strangling its exports. Finns are waking to their Sunday chores when the captain of the minesweeper Katanpää receives a message directly from the commander of the Russian naval task force. It is a complete surprise: Finns are told to remain in the Turku archipelago. Russia will take care of identifying and dismantling the mines and will hunt for the terrorists. An hour later the intelligence chief of the Defence Forces gives his update to the Finnish Foreign and Security Policy Committee that includes a number of ministers and the president. The chief of defence suggests enacting certain powers given in the emergency powers act and that Finland interprets the demilitarization treaty of Åland in a way that allows free access to the Defence Forces. The political leadership is not ready to accept the latter suggestion. They are afraid that it would send a wrong signal and could escalate the situation. On the matter of using emergency powers, the assembled ministers cannot agree whether the situation fits criteria for emergency conditions set in Chapter 1, Section 2, Paragraph 3, which states that emergency conditions include “the threat of war [or] other specific conditions outside Finland having a comparable effect“. Nevertheless, the level of readiness is raised for the military. Monday morning breaks and the main news in all countries around the Baltic Sea are about a new video that the Oil Fighters Front has published online. It says that the group will also use aircraft and submarines against Russia’s oil exports. In the background of the video there is a glimpse of the Åland islands. Russia immediately announces a no-flight zone up to 10 km that will be enforced from the sea and air. The Finnish military intelligence is informed by Sweden that the components of the division ordered to participate in the readiness exercise are still in their ready positions in Kaliningrad. The Finnish navy is then informed that three Ropucha-class landing vessels are moving to the sea. A Swedish submarine has followed them closely and the captain’s assessment is that the ships are filled to capacity with equipment and troops. A brief telephone conversation between the Finnish and Swedish Chiefs of Operation confirms one thing: Russia has with its readiness exercise created the ability to conduct amphibious and airborne assaults anywhere in the Baltic Sea region within 24 hours. Finns cannot make it to Åland in time should Russia choose to invade. A Swedish amphibious battalion has been in a high state of readiness for two days. After a quickly called meeting of the Swedish government they offer the battalion to the defence of Finland. The offer comes as a shock to the Finnish political leadership. Even though Finnish military intelligence has presented alarming assessments for a long time, the political leadership has not dared to decide upon partial mobilization. Because of these delays only the air force has the immediate capability to defend the integrity of Finland’s territory. Finland thanks Sweden for the offer but is not ready to accept it yet. When the Foreign and Security Policy Committee adjourns, the prime minister is given an urgent message. Its main point is that Russia does not foresee improvement in the security of the Baltic Sea and the Gulf of Finland, therefore it would be important that it would be given a base from where it could fight against the terrorists. Russia suggests a joint base with Finland and Sweden. The military port in Upinniemi or the Hanko port are presented as good choices. The message ends with a statement that Russia wishes for cooperation but is prepared to take independent actions to secure a base for the operations. The Finnish Foreign and Security Policy Committee is immediately reconvened. Gotland island with city of Visby surrounded by Russian vessels. Long-range support by ballistic Iskander missiles. The situation in the Baltic Sea has become very tense. For Sweden and NATO countries only few diplomatic connections remain with Russia. Poland, Latvia, Lithuania and Estonia have partial mobilization in place and the state of readiness has been raised for NATO’s new vanguard troops. The Russian troops in Kaliningrad are in a state of constant readiness and they have had three readiness exercises within the last month. The battalion commander of Hemvärnet (national guard) of Gotland is kidnapped. This news has barely reached Swedish media when another news story breaks: the army storage buildings in Gotland have caught fire. The depot on fire is where all 14 tanks on the island are stored. A new entity called the Gotlands folkrepublik (Gotland’s People’s Republic) makes its first appearance on the internet. Their official pages state that the republic has been formed because Sweden has not been willing to defend the island nor utilize the shale gas deposits in the close proximity to benefit the islanders. Now Gotlanders are seizing the responsibility over their resources, economy and government. A Swedish JAS Gripen fighter is shot down with shoulder-launched surface-to-air missiles. All countries with any Baltic Sea coastline condemn the incident. Russia announces that despite the increased tensions it will go on with its Zapad-18 exercise. A large part of Russia’s Baltic Sea navy is on its way from St. Petersburg along the Gulf of Finland, with the intention of passing Gotland. Russia begins another large-scale readiness exercise that involves the entire western military district. In Sweden chaos ensues: stores are emptied and cash runs out of ATMs. The Swedish government is having a crisis meeting when three large car bombs go off: one in Stockholm, another in Malmö and the third in Göteborg. Svenka Islamistiska Arméen (Swedish Islamistic Army), an organization that security police Säpo has never heard of claims responsibity for the strikes. SIA says that the bombs are the beginning of a fight against the Swedish Armed Forces, this includes strikes against reservists. The next morning helicopters of an airborne landing battalion appear above Gotland; they are from a Russian Vladivostok class vessel. Heavy Ropucha class landing vessels bring additional troops to the shores carrying both S-400 and Pantsir S-1 anti-aircraft systems. Swedish attempts to prevent the landing are only partially successful: the formidable vessel-borne anti-aircraft capability parked between the Swedish mainland and Gotland limits the operations of the Swedish airforce. Gripen fighters and navy’s HMS Visby and Karlstad however succeed in sinking landing vessel Ivan Gren and the destroyer Nastoychivyy. 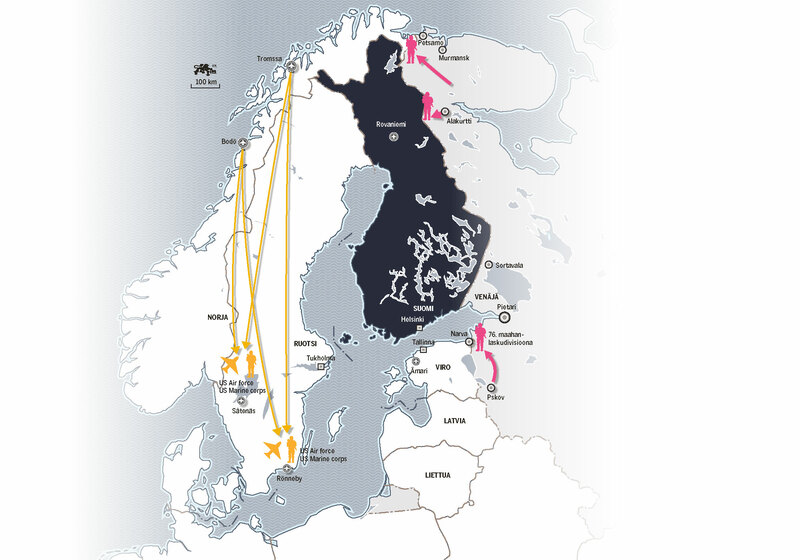 The logistics systems designed for small-scale international operations are not suited to handle the demands of the needed Swedish airforce activity. There are enough aircraft but not enough mechanics nor pilots to keep them in the air around the clock. Russia announces that it will stop its use of force if the Swedish navy with its submarines withdraws to its ports. The rapid military escalation catches Finland’s political leadership by complete surprise. Emergency powers have not been authorized, but the defence forces are in the highest state of readiness that is possible without enactment of the laws. The President has unofficially suggested that Finland should offer military support to Sweden. The Finnish government has not responded to the suggestion. By the evening news the government announces that Finland will enact certain parts of the emergency powers act and will concentrate defence capabilities around Åland. Soon after this, the Nyland brigade sends a company of volunteer coastal rangers towards Åland. The conscripts that had nearly completed their service were officially released from their remaining duties, enabling them to immediately volunteer. The transport ships are guarded by a navy vessel and a flight of Hornet fighters. One hour after the announcement, a deserted Finnish highway acts as a runway for six arriving JAS Gripen fighters. They are met by a group of Finnish aircraft mechanics who have received training on servicing Gripens. The Swedish mechanics are on a private plane flying towards the closest Finnish civilian airport. The Finns have located a massive, low-flying squadron that seems to indicate a formidable bombing strike is being prepared. Hornets are sent to make identification flights in preparation for Swedish Gripens to strike above the Gulf of Finland. Ballistic missile tracking systems operated by the United States and NATO detect eight Iskander missiles being fired. The information reaches Swedish operational headquarters near Stockholm only minutes before the first missile strikes the main building. The Swedish air force battle headquarters, StriC Grizzly and military signals intelligence (FRA) centers are also struck by the Iskanders. By the next morning, Russia’s S-400 antiaircraft systems in Gotland are positioned in a way that flying anywhere over the Baltic Sea is very risky. The United States could take out the S-400’s, but for now it is only observing and waiting. The Finnish Foreign and Security Policy Committee is facing its greatest dilemma to date. The government is split between two choices. Some are in favor of complete and open military support for Sweden, in effect a full joint defence. Russia would surely react to that. However, Russia knows that Finland is capable of striking strategic targets and neutralizing its activity around the Gulf of Finland, for example, by striking Luga from where the Iskander missiles were launched. On the other hand, some believe that Russia does not yet see Finland as being an open party to the conflict. Could Finland be the peace maker? Narva in eastern Estonia (Viro) facing hybrid warfare and Russian invation. There is a deepening split between Russia and the rest of Europe, since the invasion of Crimea and the war in eastern Ukraine. In Narva, Estonia, various non-governmental organizations have emerged, all united in their demands that all rights belonging to citizens should also be granted to minorities. The alternative the NGOs present is Narva’s separation from Estonia and joining with Russia. Estonia has raised the readiness of its armed forces and has organized joined exercises for different governmental branches in eastern Estonia (Ida-Viru). Two weeks ago there was an incident near Narva: three men and one woman were killed and two people were wounded by shots fired by the Kaitseliit (national guard). According to Russia, three of the killed were Russian citizens living in Estonia. Estonian sources state that a Kaitseliit patrol was suddenly fired upon while conducting a drill, the schedule of which was public knowledge. Russia is appealing to the Organisation for Security and Cooperation in Europe (OSCE) and the EU so that the rights of the citizens of Russia and of the Russian ethnic minority are secured. Demonstrations in Narva as well as many in social media are promoting the benefits of separation from Estonia. Earlier demands for civil rights have morphed into accusations of government officials’ systematic control efforts and arrests among the Russian population. At the same time, Russia is publishing on its government-controlled media stories saying that “Lithuanian, Latvian and Polish fascists” have been recruited to strengthen Estonian defense forces. According to the media stories, these units are already operating with NATO special forces in Ida-Viru. Demonstrations in Narva are beginning in a magnitude never seen before, and they quickly become riots. The situation becomes extremely tense when the local police chief is kidnapped and an officer of the Estonian armed forces is publicly executed. Two days later the main government buildings in Narva are in the control of armed men who call themselves Narva’s self-defense troops (Narva enesekaitsevägi). Their commander announces that they won’t allow any aircraft into the area, to protect civilians from the “terrorism of the Estonian fascist military”. The Latvian and Lithuanian governments call emergency meetings when news of the no-flight zone are carried by the media. That afternoon Finnish news broadcast that both Latvia and Lithuania have started mobilizing. The Finnish defence minister announces later that evening that even though the Defence Forces have raised their level of readiness, there are no other measures being taken due to the situation in the Baltics. Finland is not considering offering support to the Baltic countries, nor have there been any official requests to do so. Estonia demands consultations under the fourth article of the Washington Treaty, and NATO ambassadors in Brussels are called together.Estonia is also facing broad scale attacks on its information and electric networks, causing Estonia to consider call for the activation of article 5 collective defence. Sweden suggested to Finland two days ago, that they could step up monitoring in the Baltic Sea and as part of an agreement regarding the shared use of the airspace and territorial waters. The new Finnish law on Defence Forces and territorial monitoring makes this possible as of January 2016. Finnish leadership was surprised that Sweden made this request publicly, and Finland refused almost immediately. The President emphasized restraint and keeping channels of communication open. He said he would travel to Moscow before the EU emergency meeting. After three armored personnel carriers carrying the first group of volunteers from Russia crosses the Estonian border, Estonia announces that it is under an attack from Russia. The demand for collective defence is a bolt of lightning in an otherwise rainy Brussels morning. In a separate message, Estonia reminds Finland and Sweden of the Lisbon treaty based responsibility for defence and support pertaining to all EU countries. It requests armed support from both to repel the attack it is facing. Sweden responds immediately and announces that it will support Estonia and NATO with all possible means. Units of US Air Force and Marines that have earlier been at Norway’s bases in Bodö and Tromssa begin arriving in Såtenäs and Ronneby in Sweden. Russia makes a statement that this is a provocation and claims a right to preemptive strikes against Sweden if the allied troops do not leave Swedish territory. Russian forces are also regrouping elsewhere. They advance closer to the Finnish border on the Karelian peninsula and near the Arctic Circle, from the Alakurtti military base. An anonymous high-level source leaks that Sweden is negotiating directly with the US about its status. These negotiations were started when Finland had repeatedly rejected Swedish requests for enacting components of joint defence plans. According to the source, Finland forsook the joint defence fearing to endanger its special relationship with Russia. The Finnish government calls all ministers and high-level officials to return to Finland. The prime minister announces that the Foreign and Security Policy Committee will meet immediately to discuss the situation in Estonia. In the meeting the President relays a message he has received: Russia says that should Finland become involved in the situation with Estonia, this would force Russia to take direct countermeasures. Involvement includes military cooperation with third party countries. Finally the committee decision is formulated in a way that it will be unanimous. Preparations for the expected responses to the decision are begun immediately.